The Newport Resort is located in the village of Egg Harbor. The village is increasingly becoming well known by visitors and locals alike as a Door County favorite. Egg Harbor is located half way between Sturgeon Bay and Sister Bay, two of the largest “hubs” in the area. It has great shops & galleries, all within walking distance, and a beautiful park overlooking Egg Harbor’s marina and beautiful harbor. You can also find plenty of great places to eat - and you can walk! Casey’s is one of our favorite dining spots for smoked and BBQ, plus full cocktail bar, read our review. The resort itself is gorgeous! It’s just a couple of blocks off the main road, positioned on a small ridge overlooking the village. We liked the practical and easy to use layout of the resort. The main entrance and lobby serve as a center point with three wings (North, South & East) connecting to it. DoorCountyNavigator.com likes this gorgeous resort, just off the main road on a small ridge. You will too! In Newport Resort's lobby you will find a great sitting room where guests can watch TV or just plain relax in front of the fireplace. Off the main lounging area is a nice room with two round tables to sit and visit, or to play one of the many board games provided. Newport has a video library with over 225 movies that guest can rent at the front desk. Premium suites, some with a water view, are located in the North and South wings. We viewed several of the suites as part of a guided tour we took with the general manager of the resort. Read on! We like this place! All the suites at Newport, decorated in French country décor, are very clean and premium rooms offer sunset views as well as upgraded amenities. 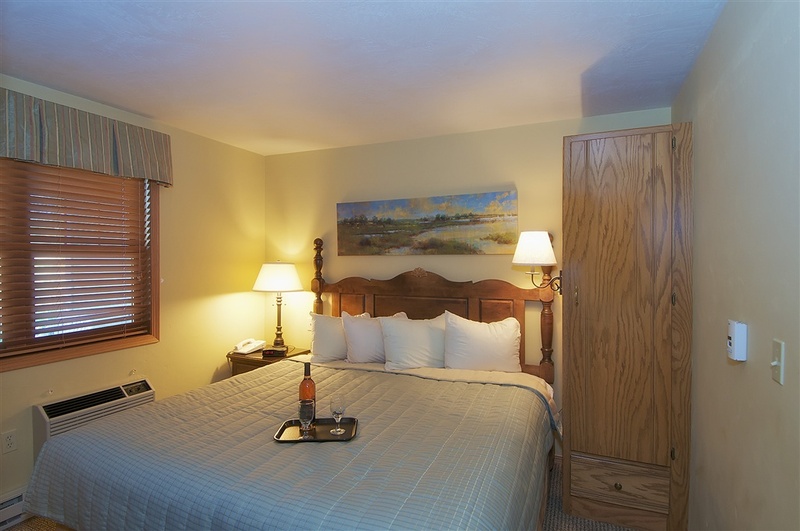 We suggest speaking with the front desk for specific details when making your room choice. All 59 suites include full sized, fully equipped kitchens, double whirlpool baths, living rooms, TV/VCR, fireplaces and private patio or balcony. As we mentioned, we viewed many rooms. The following information will give you a good idea of what you can expect to find at The Newport Resort. The suites in general are very nicely appointed and very well maintained. As you enter, the kitchen is to your left and includes all the appliances and gadgets you have at home including some you may not - like built in garbage disposal, dishwasher and blender. To the right is the guest bathroom, which can also be accessed through the guest (or second) bedroom. The bathroom in this suite is handicap friendly with a fold down seat in the shower and “roll under” sink. Note: not all suites are equipped in this way; we suggest speaking with the staff when making your reservation if you require these services. The guest bedroom is fully carpeted with a queen bed, a nightstand and closet on either side of the bed, ceiling fan, chest of three drawers and a TV. All the TV’s are connected to the main TV/VCR in the living room, allowing movies to be watched from any TV; and the system allows for viewing of different programs at the same time—great for families! A dining table and four chairs separate the kitchen and living room. The master bedroom has a nice king bed, with a closet to the left and a nightstand and lamp on the right. A dresser serves as a TV stand and there is a good sized window looking out over the backyard. The double whirlpool tub is surrounded with tile and there is a stenciled flower boarder that runs across the top of the walls. The living room has plenty of space and has two chairs and a couch that pulls out into a queen bed. An oak finish mantel highlights the fireplace (gas) that has the TV/VCR built in to the wall above it. There are plenty of windows and a doorway leading to a nice patio. Overall you will find this room to have lots of natural light and plenty of room to put your stuff. The floor plan for the one -bedroom suite is very similar. Suites with one bedroom have king beds, combination double whirlpool tub/shower units in the generous-sized bathrooms, and come with TV’s in both the bedroom and living room. This is a great suite that features an outdoor covered balcony with two levels! You enter the balcony through a set of patio doors from the living room. Once outside you are actually under the “tower” that extends up from the center of the building. From here you have a really nice view of the village and bluff line to the Southwest. Very pleasant view of the grounds, which are nicely, landscaped—lots of colorful tulips were in bloom at the time we were there. You can even see the marina and a distant water view from here, and from this vantage you’d definitely get a great sunset view too. On the lower level of the patio there is a larger oval patio table and four chairs. The upper level has more chairs, and both levels are fully carpeted. The suite itself has two bathrooms, one across the hall from the guest bedroom, the other in the master bedroom, which also has the double whirlpool tub. The Newport offers some really great features that we feel are worth mentioning. We loved how they designed the kids play area. There are two play areas at the Newport, one inside and one outside! The inside area is bigger than most we have seen with a ton of room for the kids to romp around in. There are tunnels, a tube slide, swing rope, hanging blocking dummies, and a really big ball pit. There is even a shoe rack and chairs for parents to sit—great! From this area you can go right outside to the outdoor play area. This area has a great jungle gym including two slides (one spiral), ladders, three swings, climbing rope and a children’s picnic table built in underneath. The area itself is very protected and has wood benches and perennials around the boarder. Of course, the Newport has an indoor pool. As a matter of fact, they have an indoor AND an outdoor pool. The indoor pool his slightly larger than most that we have seen. It has a vaulted knotty pine ceiling and loads of windows. We liked that they have lots of tables and chairs (over 12 tables and 40 plus chairs) for sitting around the pool. A large hot tub holds 16 comfortably. The sauna is first class and can easily accommodate 10 adults. On one end of the poolroom there are windows that look into the adjoining kids play area and on the other end there is a large bank of windows and a set of glass doors leading to the outdoor pool. This pool is great! It’s set into the resort offering protection on two sides and has lots of outdoor lounge chairs and cocktail tables. A great place to catch the sunrays and stay out of the wind. Protected, private and convenient! It even has larger tables with umbrellas if you need a break from the sun! The Newport Resort offers other amenities you would expect from a resort of its class, like conference rooms (audio/visual equipment provided), a first class exercise room with TV and game room for the kids. The game room, both pools, both play areas and exercise room are inter-connected and can easily be reached from anywhere in the resort. Each wing of the resort has an elevator for your convenience; there are two outdoor gazebos, one with four outdoor gas grills for guests to use—awesome. Great place to stay, great location and we highly recommend it! Newport Resort!